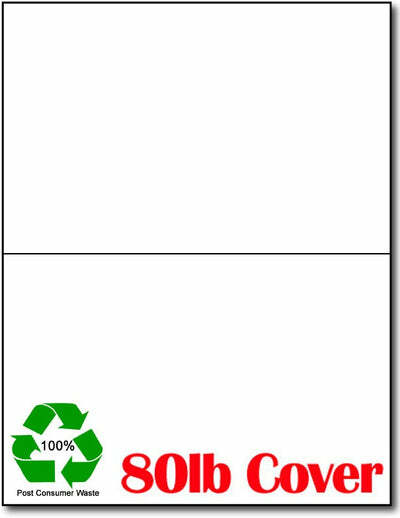 Looking for an eco friendly greeting card solution? Look no further than our 100% Recycled White Half Fold Greeting cards! These White half-fold greeting cards are made from an 80lb cover (218gsm), 100% post consumer waste card stock and are inkjet, laser, and copier compatible. These Half Fold Greeting Cards are packaged flat measuring 8 1/2" x 11" so yo can run them through your home printer. The cards are scored and measures 5 1/2" x 8 1/2" when folded. Use our bi-fold cards for wedding invitations, birthday cards, invitations, announcements or greeting cards!